Search the Internet for Brian Victoria - there's a lot there. 5-16-16 - RELIGION AND WAR: THE WARTIME TRIBALIZATION OF UNIVERSAL RELIGIONS - on think.iafor dot org, "The Academic Platform"
1-15-14 - Here's the film Zen at War with Japanese subtitles for free. - thanks Brian Victoria who warns there's an ad up front and that it loads slow. 11-01-14 - The End of a (Zen) Buddhist Myth - In this response Brian Victoria writes, "I have done my best to keep the focus of this article on the "big questions" rather than a seemingly petty debate with Jundo Cohen on the minutiae of translations." 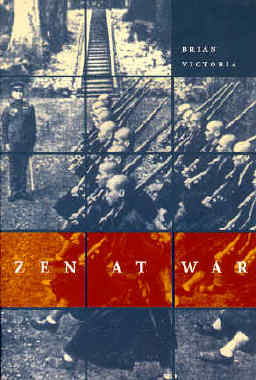 - another article on Zen and war by Brian on Sweeping Zen. 9-10-14 - Brian Victoria: The "Non-self" as a Killer - an addenda in Sweeping Zen to his two part Zen Masters on the Battlefield featured herein earlier. 9-02-14 - Brian Victoria page on The Asia Pacific Journal: Japan Focus. Check out the top piece - Zen Masters on the Battlefield (Part II). 6-27-14 - Brian Victoria page on The Asia Pacific Journal: Japan Focus. Check out the top piece - Zen Masters on the Battlefield (Part I). I greatly appreciate Brian Victoria's enormous contribution of shining light on the role of Japanese Buddhist institutions and individuals during Japan's era of militarism in the last century. I am grateful to him for his invaluable assistance with Crooked Cucumber. We stayed up all night arguing and coming to terms, emails followed, and overall I'd say he set me straight. There are now links on cuke dot com to all three of these articles and today to this page and these links will reside on the Brian Victoria page with other links going back 15 years. He has urged me to make critical comments on these articles. I appreciate what others have contributed - give him hell, he's a fanatic. But I don't have anything to add other than to note this conversation causes me to reflect on what evils am I going along with now as our Zen ancestors did to varying degrees. I'm against America's and other countries' fighting and destructive military operations. To me it's a lot of violence that begets violence. I'm against the nuclear weapons we humans have cocked and aimed that could destroy us all. I'm convinced that the carbon dioxide and methane we and others are releasing or causing to be released are likely to bring an end to us and other higher forms of life - possibly in the near future. What am I doing about all this? Hoping I'm wrong, posting on cuke, living lightly for someone in the ruling class, recycling when I can, going to the beach. To me we are all war and climate criminals to some extent. I will, however, associate with anyone regardless of how evil they are perceived to be. And I salute Brian for what he does. 7-26-12 - A comment on Warrior monks on the Buddhist Blog. In a recent edition of The Eastern Buddhist, Professor Brian Victoria continues his criticism of the writings of D. T. Suzuki. (The article is here, in PDF). Kemmyo SATO and Tom Kirchner on D.T. Suzuki & War. — a resounding response to Brian Victoria's attacks. A very important paper is in the spring '09 issue of The Eastern Buddhist by SATO Taira Kemmyo. "D.T. Suzuki and the Question of War." Translated by Thomas Kirchner (a Rinzai Zen monk in Kyoto.) -- pages 60 to 120 -- in which Sato and Kirchner have gone through a lot of D.T. 's old letters and writings in Japanese and throughout it's clear he was never prowar or a pro-nationalist. Sato says there were Zen priests who thought the war was a good idea, and it is appropriate to bring this information forward. But he goes on to say, Suzuki was not one of them and Victoria's attack, based on mis-translation and other errors, should be revoked. This is in Eastern Buddhist Vol 39, #1. 3-31-05 - a letter from Brian Victoria wherein he discloses that Zen at War will be back in print soon. from the Acknowledgements of Crooked Cucumber - And [thanks to] Brian Victoria, who commented on the sections about Shunryu Suzuki and Japan's militaristic period, with thanks for his skeptical tolerance of my unscholarly narrative method. From the cuke.com files: a 1999 letter and response by DC on Brian Victoria and a Tricycle article and more. Critical Comments on Brian Victoria's "Engaged Buddhism: A Skeleton in the Closet?"